(Nanowerk News) Storing solar energy as hydrogen is a promising way for developing comprehensive renewable energy systems. To accomplish this, traditional solar panels can be used to generate an electrical current that splits water molecules into oxygen and hydrogen, the latter being considered a form of solar fuel. However, the cost of producing efficient solar panels makes water-splitting technologies too expensive to commercialize. EPFL scientists have now developed a simple, unconventional method to fabricate high-quality, efficient solar panels for direct solar hydrogen production with low cost. The work is published in Nature Communications (" Self-assembled 2D WSe2 thin films for photoelectrochemical hydrogen production"). Many different materials have been considered for use in direct solar-to-hydrogen conversion technologies but "2-D materials" have recently been identified as promising candidates. In general these materials--which famously include graphene--have extraordinary electronic properties. However, harvesting usable amounts of solar energy requires large areas of solar panels, and it is notoriously difficult and expensive to fabricate thin films of 2-D materials at such a scale and maintain good performance. Kevin Sivula and colleagues at EPFL addressed this problem with an innovative and cheap method that uses the boundary between two non-mixing liquids. The researchers focused on one of the best 2-D materials for solar water splitting, called "tungsten diselenide". Past studies have shown that this material has a great efficiency for converting solar energy directly into hydrogen fuel while also being highly stable. Before making a thin film of it, the scientists first had to achieve an even dispersion of the material. To do this, they mixed the tungsten diselenide powder with a liquid solvent using sonic vibrations to "exfoliate" it into thin, 2-D flakes, and then added special chemicals to stabilize the mix. Developed by Sivula's lab (2014), this technique produces an even dispersion of the flakes that is similar to an ink or a paint. The researchers then used an out-of-the-box innovation to produce high-quality thin films: they injected the tungsten diselenide ink at the boundary between two liquids that do not mix. Exploiting this oil-and-water effect, they used the interface of the two liquids as a "rolling pin" that forced the 2-D flakes to form an even and high-quality thin film with minimal clumping and restacking. 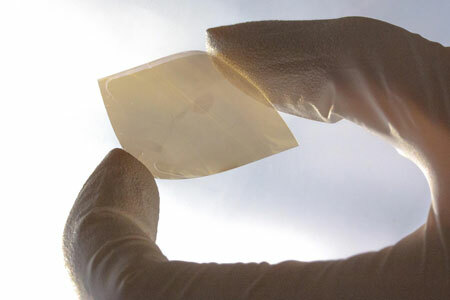 The liquids were then carefully removed and the thin film was transferred to a flexible plastic support, which is much less expensive than a traditional solar panel. The thin film produced like this was tested and found to be superior in efficiency to films made with the same material but using other comparable methods. At this proof-of-concept stage, the solar-to-hydrogen conversion efficiency was around 1%--already a vast improvement over thin films prepared by other methods, and with considerable potential for higher efficiencies in the future. More importantly, this liquid-liquid method can be scaled up on a commercial level. "It is suitable for rapid and large-area roll-to-roll processing," says Kevin Sivula. "Considering the stability of these materials and the comparative ease of our deposition method, this represents an important advance towards economical solar-to-fuel energy conversion."